A glorious headed goal at Abbeyfeale United on September 9th 2012 during a 3-1 Premier Division victory sent Darragh O’Grady to the table with the other five Ballingarry players to find the net 50 times for the club. Like Eoin Kennedy and Francis Kiely before him, both 50 club members, he is also a product of the highly successful underage structure and has played with the club from under 10 upwards. Considering that he is regarded as an extremely versatile player capable of performing in most outfield positions it would be considered a considerable achievement to notch 50 goals during the 298 games he had played for the club to get to the 50, a strike rate of just under one in six. He has scored during every season that he has played for the club with his best return of nine during season 2006-07 while he has scored in every competition he has represented the club in. His 10 Desmond Cup goals to date sees him second highest club scorer in that competition. 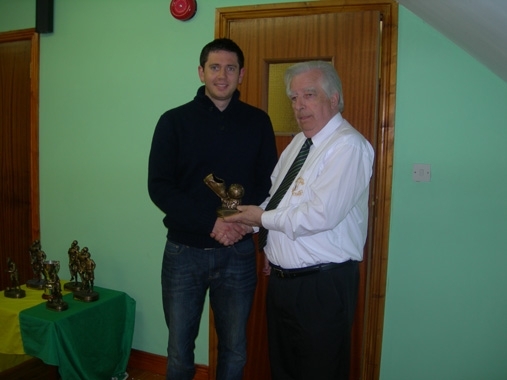 He opened his account for Ballingarry at home against Turnpike Rovers (CDFL) in the first round of the FAI junior cup on October 10th 2000, a game the team won 3-0.